It’s that time of year again…TAX TIME!!!! This year I’ll be responsible for getting the taxes done for two households: my own and my father’s (side-note: my dad has frontotemporal dementia, as explained here). Last year at tax time, my brother physically went with my Dad to an H&R Block to have his taxes done, at his request. It worked out, but was a whole mess because then my Dad lost all of the tax paperwork after-the-fact and it’s been a huge pain as I am the person who handles all of his finances. I really could use those year-end statements!!! This year, given another year of progression of his cognitive impairments, my dad no longer cares about his taxes so I can handle them entirely myself without needing to include him (this is always a tricky balance because he cannot be in charge of his own finances, but he still wants to have some oversight and say in how things are handled. It’s totally understandable, but presents a challenge since he doesn’t have the mental capacity to fully think through financial decisions, etc.). For our own household, we’ve either done our taxes ourselves (in years past) or used H&R Block, too. This year, I want to do better. I’ve never been a huge fan of the cheap drop-in type of tax places. I want to hire a CPA that we can have an ongoing relationship with. Someone who knows our finances and is knowledgable enough that they can make recommendations (e.g., donate $X or contribute $X to whatever tax-advantaged account, in order to save $x in taxes) and know all the little ins and outs of tax laws. I want to pay what we owe, but also to limit our liability in whatever (legal) ways are possible. Also, there’s the whole issue that I live in Arizona and my dad lives in Texas. I’m flying back for a couple of days in March to handle some of my Dad’s affairs (I will be scheduling meetings with: an estate attorney, a CPA, and a financial advisor). I’m assuming my Dad’s CPA needs to be someone physically in Texas, given that state-level tax laws are obviously different state-to-state. Here’s my issue – I have NO IDEA how to find a reputable CPA. None. So I come to you all, as you are way more knowledgeable about this than I am. How do I find a really good CPA? Where would I even search? Google? Yelp? Help! And as a side note….I’m pretty nervous about this year’s taxes. Gulp! The past couple years I’d been paying estimated quarterly payments so our tax liability in April was pretty minimal (usually about another $1500ish or so). This year, I haven’t done any estimated payments at all. UGH!!! We have made some hefty tax-credit approved donations so our state tax liability should hopefully be zero (knock on wood). And I’ve had taxes removed from my full-time paycheck so hopefully that will help offset the burden of what we would otherwise owe. But, we’ve had a lot of income that hasn’t had any taxes removed (both hubs’ business income and my part-time contract based job do NOT have taxes removed from checks). Sooooo, pretty sure we’ll end up owing a pretty penny. I’d like to get our taxes all figured out by mid-March so we have March and April to try to gather up our funds and hopefully pay the IRS in full so we don’t end up having to pay interest and penalties, etc. Worst case scenario, we could pay by the mid-April deadline on a credit card, which would buy us one extra month to pay off everything in full (since purchases made in April wouldn’t be due until May. Note: I NEVER carry a balance on my credit card!! Any purchases made on the card are paid 100% in full by the next month’s due date). That would allow us THREE months to spread the IRS tax bill over. With how high our income is, we should be able to scrape up the funds. But it also depends on how high our tax debt is. NO FUN!!! Have you done your taxes yet for 2016? Any tips on finding a great CPA? IMHO having a good CPA is invaluable and as your post alludes, not all are created equal. I would start by seeing if any colleagues or neighbors have recommendations for local professionals they have used and more importantly stuck with over the years. If you are on any “mommy” or community Facebook groups this can also be a valuable resource. I don’t have children and joined one of these FB groups solely for the reason of seeking advice. The group that I am part of has a large following and there almost always seems to be someone that has been there, done that and has an opinion they are willing to share. You may want to try Google also, but tread lightly, word of mouth is how I found my accountant. Also, you may actually be able to find an accountant that can do both your HH and your dad’s taxes. I relocated to Chicago from Minneapolis 3 years ago and my accountant I have had 15 years is still able to do our taxes. It took the stress off having to find someone new here locally and I know I can trust him. Also–be prepared to pay sometimes a pretty penny to have your taxes done. I paid $825 this year. Yes, that seems like a high number but I have W2 income, itemized personal deductions and other business income. It has become a budget line item for me. I think you can likely find someone cheaper (my accountant works for a big firm and is one of the longest standing members there), but I would be prepared to spend $300-$600. Figure that into your budget. Wow. That’s scary that you have absolutely no idea what to expect for taxes. You’ve been earning contracting income for years. I expect you would have figured it out by now! In my opinion that’s almost as bad as the people who are ignorant of their debt balances. It is a debt balance if you owe, especially a significant amount. There’s a 2% fee to pay taxes on credit card. So maybe open up a new credit card (or two!) with a hefty sign-up bonus to pay the taxes on. Then at least you can reap some travel rewards. I got the Chase Reserve card to pay my taxes on (I do have the money though). By doing so it will help me get a $1k equivalent signup bonus. Sorry if it sounds harsh. I’m just really surprised you overlook/minimize taxes but are on top of everything else. With the amount of non-W2 income you make I imagine your bill can be quite high. Angie–I do see your point; however I don’t think that Ashley has completely ignored this in the past as she said she has paid in quarterly taxes. 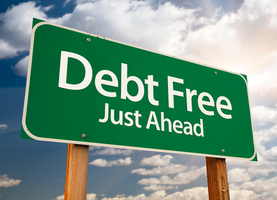 I think in debt payoff it is often a (albeit a big one) variable that is overlooked when you get laser-focused on debt payoff. Even Stephanie at sixfiguresunder.com has admitted that she let taxes get away from her this year after paying off all there debt. They ended up owing a lot of money due to self-employment income, etc. Ashley has done a lot of things right-deferred income in retirement accounts, 529 plans, charitable contributions, etc. Additionally, as a first time home buyer they might qualify for some special deductions, rebates, etc. Ashley, you will know to plan for future years and I do recommend (in addition to my comments above) to checking in with your accountant mid-year, once you have one, to evaluate where you are at. This may become less important as you and your husband transition out of self-employment, but I have found it to be a good check and balance, so I can make adjustments at the end of the year. I don’t have advice on how to find a CPA but I wanted to let you know that I live in the Midwest, but my CPA is in California, so it is possible to find someone in Arizona that is familiar with Texas’ laws. It might be even better if you could use the same person for your taxes and your dad’s, it might save you some time. Yes, I was going to say the same thing; ours is in Indiana and we are in Kentucky. Also, I found paying the CPA was much cheaper than HR Block ($125 vs $300). We are pretty simple to file though, basic W2 etc. We’ve used the Dave Ramsey ELP (Endorsed Local Providers) program in the past with good luck. We used a CPA for taxes while we were resolving my mother-in-law’s estate after she passed away and there were lots of nuances. The ELPs are a good starting point (you submit a form on Dave Ramsey’s website and then the local ELPs contact you) but you still need to do your own vetting- check reviews, meet in person and determine if they are good fit. I think the ELPs pay a fee to be part of the network, but program also does quality control to ensure they are good providers. The ELP’s merely pay Dave Ramsey to have their name on his website. I would stay away from anything with Dave Ramsey. He makes a boatload by milking churches to do his marketing and classes. Very unethical. Texas doesn’t have state tax, so why are you concerned about it? Is there a resource through your work? A credit union or EAP type organization (our EAP does more than emotional counseling type referrals). Best way to pick a CPA is setting up face to face meetings, explaining a little bit of your situation and listening to their responses and price quotes… You’ll get the feel for who sounds not only knowledgeable but trustworthy at that. Having a CPA doesn’t make them a good person. There’s a lot out there who only care about their fee and not truly helping the clients. Finding an accountant – ask friends and relatives in AZ and TX. My accountant is in DC, I live in AZ – a really good one panhandle taxes in any state. Mine is great, my taxes can be complicated, but I don’t know if you want one that long distance. FYI – In terms of taxes – did you have withheld as least as much as you owed last year (in total – not just the 4/15 payment)? If not, you may be looking at a penalty too. Really random side note (apologise ashley for hijacking this thread). Do you readers have suggestions for other debt bloggers? Not like MMM or any of the established ones, but ones where people are currently working on getting out of debt and chronicling their story (so not a blog that’s just full of financial tips). It seems that we get only Ashley consistently (Steph, is everything okay on your end?) and it’s just not enough to feed my itch lol. I used to have a lot on my blog roll but many have either paid their debt off or fallen off the wagon and it’s hard for me to find new ones in this payoff stage. anyway, any leads would be helpful – or even what to type into google as search that won’t bring up the standard staples. You can sort by all sorts of categories! You should be able to find someone you like-there are over 800 blogs listed! I would think your local CPA ought to be fine for your dad’s taxes since Texas does not have state income tax. Ask locally before seeking someone in Texas! Some of your colleagues who have recently relocated to your area may be able to provide a CPA recommendation for you. Typically, CPAs in areas with universities or with high job growth/creation have experience with filing income taxes in other states because the year of moving requires forms for both states (assuming both states have income taxes). Also, anyone who owns a business or has rental income in another state may need to file income tax as a non-resident, so CPAs can generally handle taxes for any state, regardless of where their practice is located. Once you narrow down your list of candidates, you can ask for references who use services similar to what you require, and talking with them will give you a better idea if the CPA will be a good fit. Good luck with your search! Ditto on the advice that your CPA doesn’t have to live in the state to handle that state’s taxes. He or she just needs to know how to do the taxes and be familiar with the state’s tax laws. My mom is a CPA and has even done tax returns for Canadians! As to finding a CPA… There are different approaches. There are CPAs who strictly by the book, and CPAs who a little looser. Tax laws are laws, and as such can be open to interpretation and may not account for all possible situations. As a result, some CPAs might act on the side of lowest audit risk while others might act on the side of saving the client money. This may come into play more with corporate/business returns than personal returns. So choosing a CPA is also based on your own comfort level with how much you want to risk an audit. Some CPAs who act on the side of saving you money may only take on a 1% audit risk, while others might take on a 10% audit risk. It varies. Please keep in mind that you do not need to go to a CPA, an Enrolled Agent(EA) is someone who is usually more knowledgeable about the tax laws and is required to pass an exam that is almost entirely tax related. A CPA is required to pass an exam that in comparison is mostly financial reporting and audit related. So, an EA would probably be a better idea since you don’t also require financial reporting and audit services. In my area, an EA is usually less expensive also. You can find a list of all EAs that are currently licensed on the IRS website. That may depend on the state in which the CPA is certified. There are 4-5 parts of the CPA exam, and different states have different requirements for how many parts the CPA needs to pass. I don’t know what AZ’s CPA requirements are, but I do know that MA has one of the strictest set of requirements. Just to clear up some misinformation: the CPA exam is the same in all states and is four parts, one of which is Tax. You have to pass all the parts. Each state can have its own educational and work requirements for licensure, but most (maybe all at this point) require a Master’s Degree in Accounting or 150 hours of college (5 years) with 30+ hours in accounting. Typically, you also have to work for a year + before you can apply for your license. The Enrolled Agent exam is three parts, all of which are Tax. There are no educational or work requirements. On topic: at this point, you didn’t make your quarterly payments and that just is what it is. Steel yourself to know you are going to owe a lot and find someone to help you make a plan for next year so you don’t find yourself in this situation again. Cheers to everyone dealing with their taxes – tough time but absolutely necessary! thanks for such a helpful tips. i will be following this blog for updates.